Landscaping is more than trees, shrubs and flowers. It also includes things that do not grow. 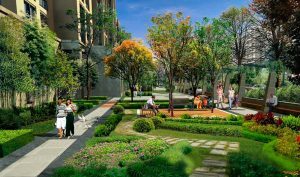 Hardscaping is an innovative approach to landscaping suited to urban condo living particularly where green space is at a premium. Hardscaping refers to landscaping that is not alive. This includes lighting, patios, artwork, fencing, walkways, seating, fountains, barbecues and driveways. It can help correct problems on the property. A fence may serve as a windbreak or a stone walkway can be placed in an area where grass will not grow. Hardscaping can provide outdoor community or entertaining spaces where there is a shortage of green space. It requires less maintenance. Hardscaping does not require mowing or watering, and is unaffected by extreme heat or water shortages. Hardscaping involves other considerations. Metal seating can get hot when in direct sunlight. Wood materials can fade or chip and require periodic updating. Fountains will require periodic cleaning, wood will need to be reconditioned and bricks power washed. The best landscaping likely includes a combination of hardscape and traditional landscaping to make the best use of available space and location. It requires the services of a good landscaping company and design services.